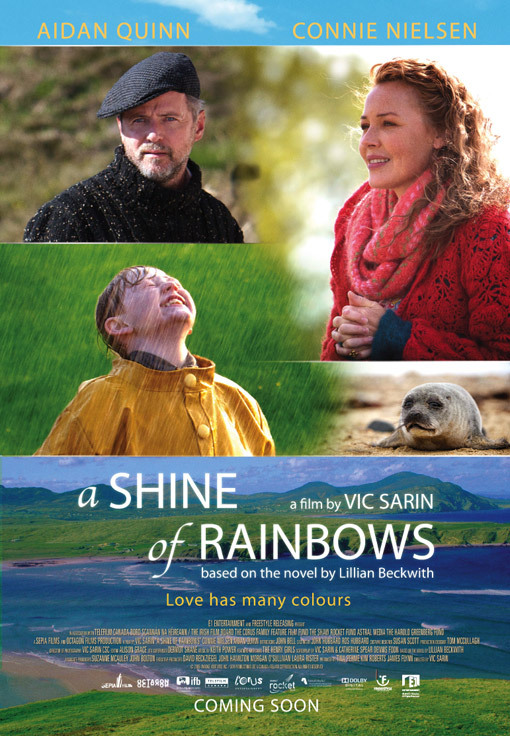 ‘A Shine of Rainbows’ has recently been released in Canada and the USA. Shot in Ireland in 2007, the movie tells the story of an orphan boy who finds a new life on a remote island where he comes to terms with his surroundings, the local folklore and learns the secrets of seals. The production stars Aidan Quinn (Legends of the Fall, Benny and Joon, Stakeout), Connie Nielson (Gladiator, Devil’s Advocate, One Hour Photo) and introduces John Bell as Tomas. Featured in the film is Smudge, a fully anamatronic seal pup created at Neil Scanlan Studios and puppeteered by Brian Herring. Neil’s crew created and performed a pup so realistic that director Vic Sarin chose to use the anamatronic over any footage of real seals! For more information on the movie click here. Look out for the UK release date.